Energy Transfer Partners To Buy Sunoco For $5.3B The acquisition would give Energy Transfer the capability to transport crude and other liquid hydrocarbons that are being produced in greater quantities thanks to the boom in shale drilling. 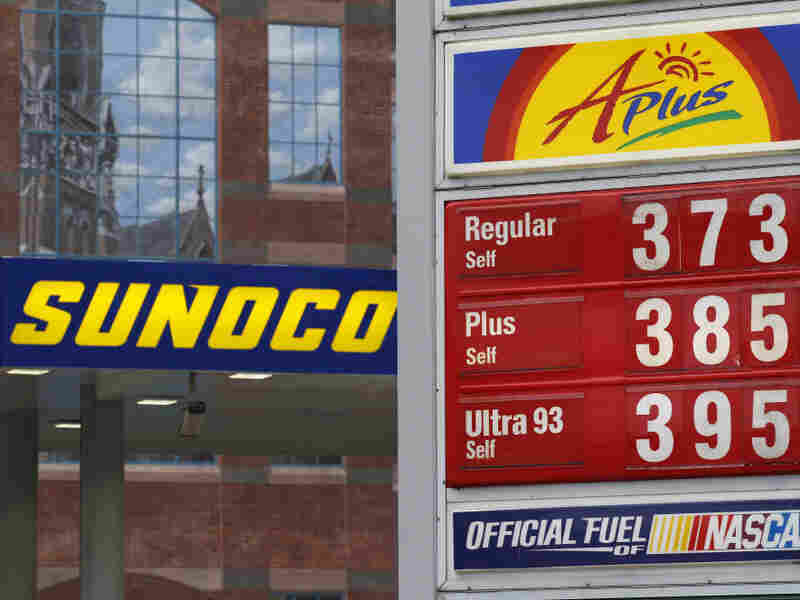 Sunoco operates about 4,900 gasoline stations around the United States. Natural gas pipeline company Energy Transfer Partners is buying Sunoco in a deal valued at about $5.3 billion. The acquisition would give Energy Transfer the capability to transport crude and other liquid hydrocarbons that are being produced in greater quantities thanks to the boom in shale drilling. Sunoco's pipelines crisscross the country, connecting the Great Lakes and Northeast to America's refining center along the Gulf Coast. Energy Transfer Chairman and CEO Kelcy Warren said the company has been looking to diversify into oil pipelines in response to an expected slowdown in the natural gas pipeline business. Some oil and gas production companies have been taking natural gas operations offline following a plunge in prices to 10-year lows. Many are now focused on producing more domestic crude oil, which is both cheaper and of a higher quality than imported crudes. "We needed to be more diversified," Warren said in a conference call. "We needed to be more involved in the movement of crude." The acquisition continues a run of deal-making for Energy Transfer. The Dallas company bought Louis Dreyfus Highbridge Energy for $1.93 billion in May 2011. And Energy Transfer Equity, which owns Energy Transfer Partners' general partner, bought Southern Union for more than $5 billion in March and Regency Energy Partners for $300 million in 2010. Sunoco Inc., based in Philadelphia, will continue its exit from the refining business. It already has shut down a refinery in Marcus Hook, Pennsylvania, and it is planning to sell its controlling interest in its Philadelphia refinery to The Carlyle Group. Energy Transfer Partners said the deal will bring its cash flow mix for its pipeline businesses to about 70 percent natural gas, and 30 percent heavier hydrocarbons. Company officials did not immediately return a call from The Associated Press. The offer equals $50.13 per Sunoco share. It includes $25 in cash and a portion of an Energy Transfer Partners unit. Sunoco shareholders can also opt for $50 in cash or slightly more than one ETP unit. The price represents a 29 percent premium to the 20-day average closing price of the Philadelphia company's shares as of Friday. Shares of Sunoco Inc. were up 19.5 percent to $48.89 in midday trading Monday. The boards of both companies have approved the deal. It's expected to close in the third or fourth quarter of this year. Regulators and shareholders must still sign off. Sonoco will continue to be based in the Philadelphia area.